If you haven't made a trip to Honeypie now is the time to go! Eric and I enjoyed our first meal at Honey Pie last week and were so impressed. The locally sourced food is absolutely delicious. The environment is warm and inviting with a calm energy, just what you want for a relaxing but fun dinner. -Chicken breast entrée: What's great about Honeypie is that they have a list of entrees that are constantly rotating, so every time you go you'll have different entree options to choose from. I went with the chicken breast entree, and am so happy I did! The chicken breast was served over chive mashed potatoes surrounded with a homemade broth. The chicken was moist, tender and flavorful. I wish I could have this for dinner every night. I would 100% recommend ordering the chicken breast. -Macaroni and Cheese: I heard from a few people that the Macaroni was amazing. I had to try it but didn't want it as my entrée, so naturally Eric and I get it as an appetizer. If you go to Honeypie, it would be wrong if I didn't tell you to try the Mac and Cheese! It's a knockout. A mix of 2 cheeses, topped with breadcrumbs, parmesan and bacon. Yes, bacon. -Porkslaw BBQ Sandwich: A house favorite we had to try. The sandwich was beautifully crafted, the texture of the meat was perfect and the coleslaw was amazing but I have to say this was not our favorite. I think it lacked flavor. We were expecting a little more BBQ taste that just wasn't there. However the fries, were perfection. Not a bad sandwich, but not my first recommendation. 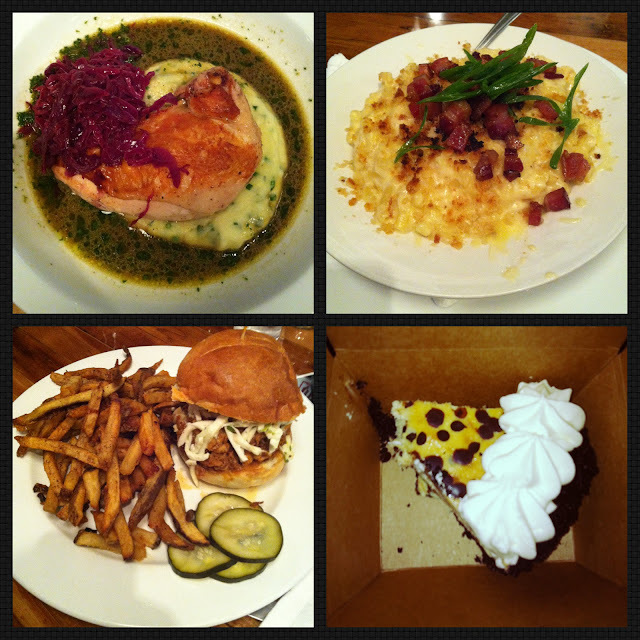 Overall, everyone in the milwaukee area should dine at Honeypie. The food was worth the visit and the environment is equally pleasing. Eric and I went for dinner but I've heard the brunch is fantastic. I'll definitely be trying that soon!